#150 Mini - The Best Model for a Tight Space! 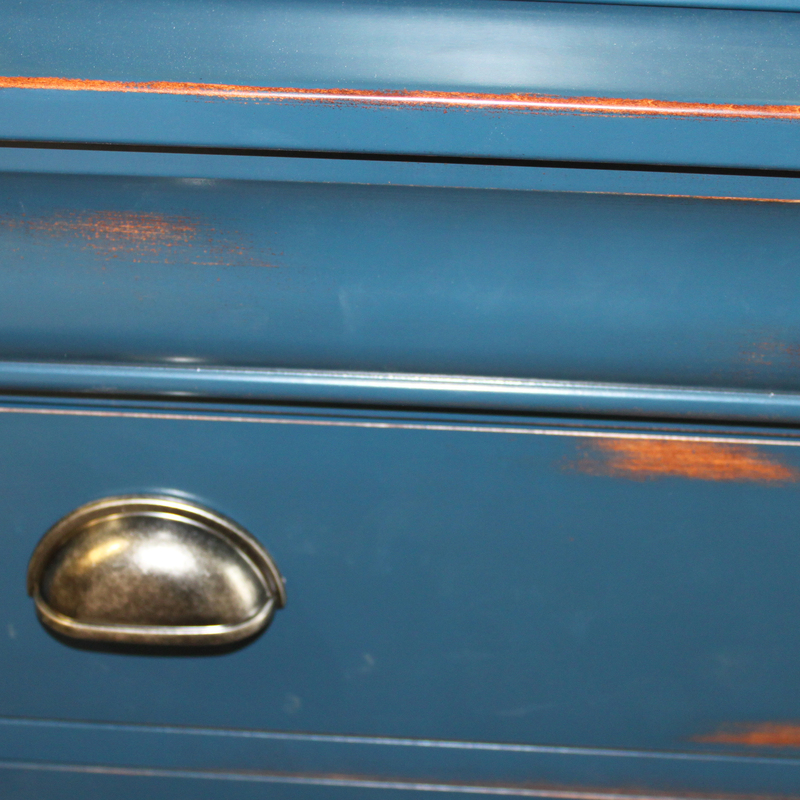 Do you wish for a sewing machine cabinet but have no idea where it would fit in your small house? Are you tied to a tight budget? Gristmill Collections designed The Mini for you! This economy model is our cheapest and smallest sewing cabinet. When closed, the top measures less than a yard wide (31”) by 21 ½” deep. The castors on the bottom make it easy to move this sewing furniture to a convenient spot while working on your projects. A portable sewing machine cabinet comes in handy if you want to move your machine to a spot where you can supervise the children playing while you sew. The Mini holds a machine up to 18” long. 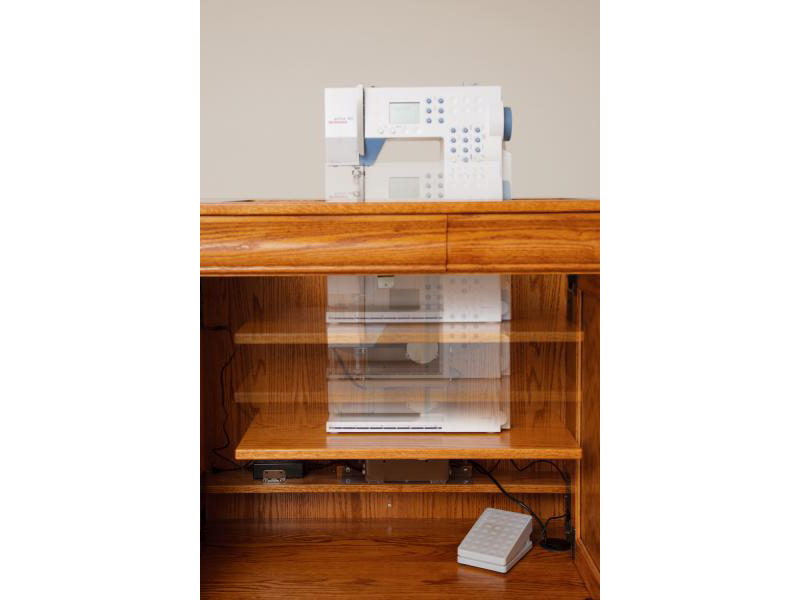 If you would like a small storage cabinet for your serger, we can customize the top to fit a serger. With the wing flipped down, the tabletop space of the Mini doubles, adding another 31”. The knee hole door opens to support the wing and allow it to hold more weight. The door has a hook that latches into the wing, securing it firmly in place. The wing provides a space for stacking quilt patches or dress pieces that you want to sew together. The Mini has enough shelves and compartments to keep your most important sewing items close by. The door pocket, measuring 3” by 23”, is the perfect place to keep sewing supplies such as scissors, spools of thread, measuring tape, elastic, rippers, pins, etc. Two shelves inside, each measuring 6” x 18”, give a handy place for storing partially finished projects out of sight. When you are finished sewing for the day, lower the machine with our airlift mechanism, flip the wing over the top, and close the door. What could make cleanup easier than this! No matter which style of sewing room furniture you order, we strive for customer satisfaction. 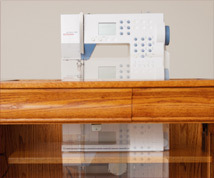 Our solid wood sewing cabinets are built to last for generations to come!